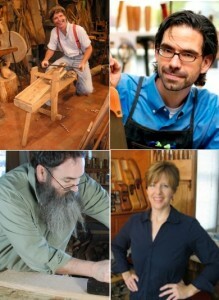 There as a post on the Popular Woodworking blog titled “Who are your woodworking heroes?” The title gave me pause, because I could think of one quickly but then I was a little more stumped. I had LOTS of heroes, so many it was hard to pick, or worse remember their names because much of what inspires me is the object, not the maker in most cases. I narrowed it down by a criteria of who started me down this crazy journey of hand tool wood-working and making things. I also restricted this list to people alive today, the modern day heroes. I have a couple of historical ones, but I’ll keep it current day for now. Roy Underhill – Sort of a “Gimme” for this list, but I really can’t say enough good things about this man. I was lucky enough to travel across the country to take a class at his school, and it’s still one of the all time best experiences I’ve had. He is an author, teacher, comedian and entertainer and is genuinely the guy he portrays on TV. I’ve read all the books, and watched as many of the episodes of Woodwright’s Shop as I can. Chris Schwarz – I sort of view Chris as the heir to the throne for what Roy has been teaching. He’s taken the cause to heart and is doing an amazing amount to promote and educate on the craft. I like the enthusiasm he shows for it, and the energy he puts into it. Writing books, starting a small press, and educating people. He’s gained a near cult of followers for his troubles, and I really enjoyed his “Anarchists Toolbox” book. One of his editorials in Popular Woodworking about what we could all do to “save woodworking” and said “start a blog!” so I did. Kari Hultman – I found her blog through another linked blog, and ended up reading the entire thing over the course of a few days. She got me excited about making wooden things, but more importantly gave me the feeling that “Hey, I can do that…” She takes great clear progress shots, and explains just what you need to try it your self. Peter Follansbee – In addition to woodworking, I have a passion for history. Peter helps combine both, and educates every one who reads his blog on both. It’s inspired me to dig deeper into what I want to do, and helped me learn relief carving quickly. He has a new book coming out, and I’m hoping he will write and write and write. I agree on all counts. Chris’ last book (ATC) pushed me over the edge into hand tool woodworking. I’m consistently impressed with both the work that Kari does as well as her willingness to clearly and humbly document what she does. What about Norm Abram? Despite the current hand tool craze, I would venture to say that Norm has gotten more people into woodworking than anyone in the last 20 years. I know alot of people today poo poo power tools, but the fact is that any woodworking is woodworking, be it electric or hand tool. Schwarz a hero? My heroes are people like Ghandi and Churchhill, maybe Captain America. I think people really need to stop burning their proverbial skil saws and get to work with whatever tool gets the job done and stop having the tools pick the job. Rant over, deep breath. Well hero is little strong for tastes and conjures up some negative aspects such as hero worshiping, but someone I respect as a mentor is Garrett Hack, someone many consider a “master”. He will be at the Port Townsend School of Woodworking this July, teaching. I have been very fortunate in taking several classes from him. I put him at the top of my list and I have taken classes from Tolpin, Rogowski and Scharwz, all of them great. I would like to take a class with Roy. I suspect he would be a lot of fun. @CT. I never really connected with Norm. Just couldn’t get into his whole thing. He did some neat stuff for sure, but I wanted to list the people that inspired me to delve deeply into woodworking, and Norm didn’t at all. I just don’t feel like buying an entire showroom’s worth of power tools to make stuff. 🙂 He does love his Brad Nailer though, and if I were only interested in speed of work, He’d certainly make the list. Also, I specified that this was a Woodworking Hero list, if we’re talking straight up Hero then I would have a different list. @Bill – if you get a chance, taking a class from Roy is a real treat. He’s pretty much exactly that guy we see on TV. He joined us for lunch and was open, honest and interesting. he’s not into this for the attention, he really believes and lives this stuff. To cut the wood for the class we took, he cut all the boards on a treadle table saw. He could have taken short cuts and no one would have known, but he lives it. I would like to try a Garret Hack class, and I might see if I can scrape up the budget to go, but I have the “By Hand and By Eye” this weekend with Jim Tolpin which I am excited to take. Not sure if I can afford another one. @CT thanks for the link, I’ll check it out! I’m a bit away from building chairs, but it’s something I’d like to learn some day. Right now my interest is in carving, I just finished a couple of small panels for my tool tote which I’ll probably post pictures of tonight after I assemble it. @Kari – You are quite welcome. Badger,……With out a doubt ……Tage Frid…a legend in woodworking history.